It is simple to make. The results are so tasty some people find it hard to believe there’s so little to it. Put a thumbnail piece of raw ginger root, peeled and chopped, in your favorite mug, top it up with boiling water and leave it for a couple of minutes to infuse–the magic word–and sip it and see! It works equally well with a sprig of thyme from the pot outside the kitchen door or a single mint leaf from the patch in the garden. Sage and rosemary too work well though the taste is stronger and may not be to everyone’s liking. 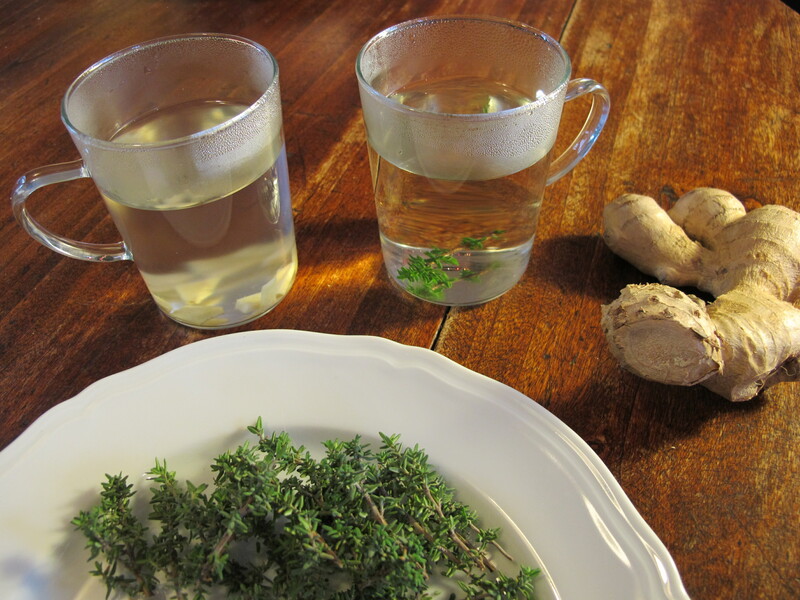 If you have easy access to the herbs it’s fun to ring the changes–seasonally especially. Our mint patch at the back shows signs of the new growth as early as March and I pounce on the first little bud that peaks out–impatient for a hint of Spring. As the mint begins to fade in October I start looking for ginger on the stalls eager for a change of season and taste. Enthusing about infusing is easy once you’ve tried it! And in my view it’s so much nicer than a bag!